Grant Gilchrist and Paul Smith are research scientists who study migratory birds with Environment and Climate Change Canada. Boris Worm is a professor and marine ecologist and Caroline Fox is marine biologist and a Postdoctoral Fellow, both at Dalhousie University. Cory Matthews is a research scientist who studies marine mammals at the Department of Fisheries and Oceans in Winnipeg. All of these scientists will work together to design coastal marine wildlife surveys for the voyage that will be done from the deck of the ship and will keep a close eye on migratory birds and marine mammals. C3 is unique, because the ship will always be close to shore, where there is a higher chance of sighting wildlife. 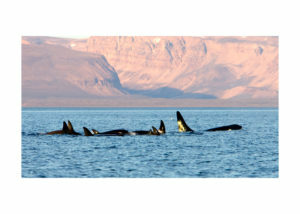 In the case of Cory Matthews, there is a special interest in the sighting of killer whales, who are being seen in larger numbers in the far North. 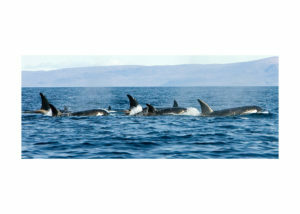 The results of the survey will create a pan-Canadian coastal wildlife database for the expedition track. 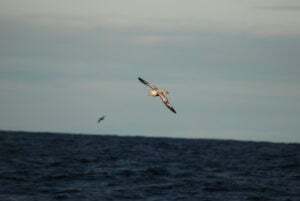 These surveys help biologists to understand how migratory animals are using marine environments, with an eye to any findings that may be linked to environmental changes.